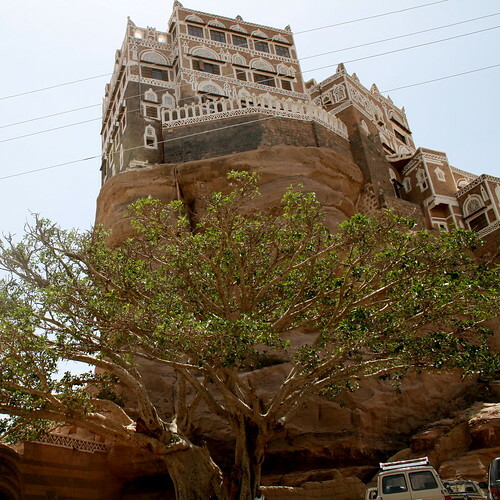 This beautiful 5 storeyed Palace located atop a protruding rock formation in Wadi Dhahr, Near Sana'a, Yemen was the summer residence of Imam Yahya, who ruled Yemen from 1926-48. The Rock Palace (Dar al-Hajr) was built in the 1930s. Reportedly some portions of the palace already existed in 1930 and Imam Yahya added several major sections to give it the present form. It is town's most recognisable icon. 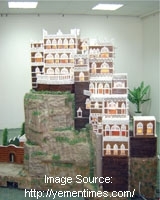 A 1.6 x 2-meter wooden miniature depicting The Rock Palace (shown above) is on display at Culture House, Sana'a. More info about the model and Rock Palace at Yemen Times. Credits: Special thanks to diane9247 for suggesting to include buildings from Yemen. Hopefully I will add more later. They should use this house in a movie. It attracts alot of interest.